I just realized that this is the tenth anniversary of Arachis Press. In a sense, anyway — I self-published my first chapbook of poetry, ‘Pieces of the Moon,’ in 2003. At that time, I styled myself ‘Nihil Crocodile Press’ and continued to do so until I put out my second book, the YA novel ‘The Middle of Nowhere,’ some eight years later! That first edition was not only self-published but also self-printed. A laser printer, good paper stock, and a long stapler are really all one needs to put out a quite decent-looking product. Distribution, however, is another matter which is why I switched to printing and selling through Lulu for the second edition in 2005. So I’ll celebrate. Yay! Okay, that’s taken care of. Now back to business! I’m working up a new catalog, reflecting the release of the latest book, ‘Retellings,’ and will have it on the site shortly. It might be time I adjusted some prices anyway and maybe even put out some revised editions (too many mistakes in both ‘Pieces of the Moon’ and ‘Dreamwinds.’). And, of course, I continue to make attempts at more books. As I mentioned a while back, I’m open to working with other authors, but I do have projects of my own in progress. Maybe I’ll finally get that fantasy novel finished. 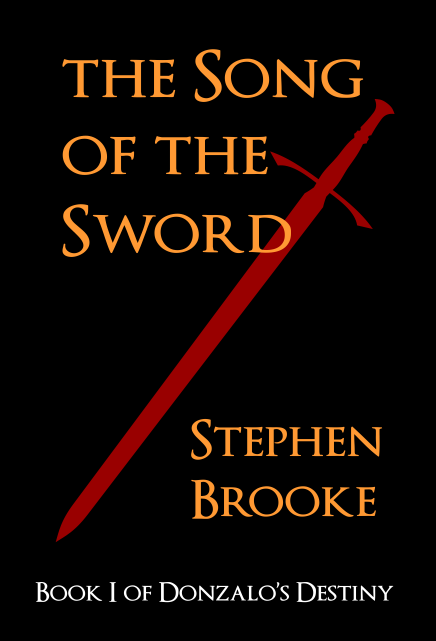 That would be ‘The Song of the Sword.’ I have decided to retain that title for the first ‘book’ of ‘Donzalo’s Destiny,’ which should consist of two novella-length parts. The first of which is long finished and well-polished — I considered releasing it on its own as a 22,000 word ebook but think I will wait. 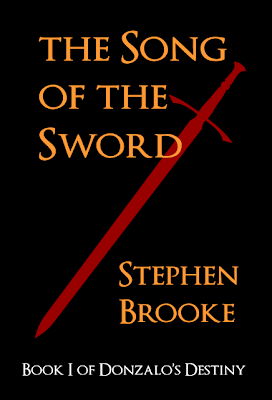 Here is a mock-up of a possible cover. I like simple and (I hope) classy presentations.